For a few days, the route of “the Train” has been intertwined with ours. We have quite deliberately stayed well behind its overnight destination, but each day, a lock or two before lunch we catch it, then suffer whatever it is we suffer as we follow its progress ever so slowly, until it eventually finds itself a lock ahead of us for lunch. Refreshed, our pattern seems to be to catch it in the only piece of river, for we are on the river now, that is wide enough to allow overtaking, and beat it to the next lock, where we are met by a mob of spectators, patiently awaiting its arrival. This must be how it feels to be the last car down a road which is lined with people waiting for the Queen. Tonight their little caravan is Auxerre with us. 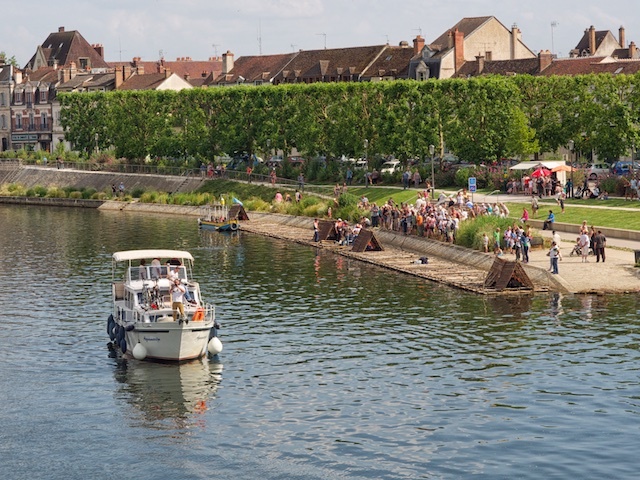 Actually we are moored somewhat upstream from the hurly burly of their reception and the little travelling fair that sets up each day, but they are here out of the canal locks, lashed together now in one ninety metre floating footpath, ready for the locks of the Yonne and the Seine. We will see them again of course, we will no doubt have delays above a lock or two as we make our separate ways downstream, but we will eventually pass, as we have done all week, and we will be there to meet them when they arrive in Paris in two weeks’ time. For now we will sit perfectly still for a few days, and wonder how we came to be part of their floating entourage.